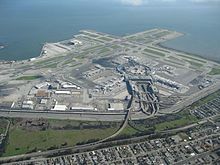 Aerial view of the San Francisco International Airport and its infrastructure. Infrastructure is the term used to describe the facilities which support modern human life. These are the main items: water supply, sewage plants, housing, roads, cable networks, food supply facilities, schools, hospitals, airports, community meeting places, business and government buildings, bridges, railways. In fact, everything that modern life needs in the way of built facilities. Infrastructure is closely connected with standard of living and overpopulation. More people will want more roads, water pipes and other infrastructure. Poor countries tend to have fast population growth and cannot provide the needed infrastructure. Standard of living drops and this may lead to other problems like worsening health, exposure to plague and difficult access of emergency units to those that need it. This page was last changed on 10 February 2019, at 09:10.